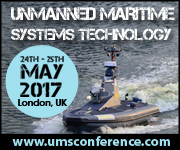 SMi's Unmanned Maritime Systems Technology will take place in London on the 24th - 25th May 2017. KENSINGTON, England - Feb. 13, 2017 - PRLog -- UMST 2017 will bring together both military and industry unmanned systems experts to discuss the future of unmanned platforms within naval warfare and the latest conclusions from Exercise Unmanned Warrior. The 2017 agenda aims to provide an opportune platform for unmanned maritime users to discuss the future roles of innovative maritime robotics systems. The conference will feature 16 presentations, 2 interactive panel debates, 5+ hours of networking time and an interactive pre-conference workshop. The two day event will cover a variety of topics from; force protection missions, mine warfare, the role of NATO to protecting the blue economy and more. "The Royal Navy's Unmanned Warrior begun the journey of integrating innovation, automated technology and warfare, by drawing on military, industrial and technical leaders to respond to the challenge. Though the environment was largely maritime, it was not solely so, because unmanned systems are not domain bounded, nor is their connectivity, or C2. The Unmanned Maritime Systems Technology Conference intends to explore all these issues through presentations. The focus will be on technological development, brand new concepts and strong leadership in the major warfare fields of Anti-Submarine and Anti-Surface Warfare, Mine Counter Measures and ISR." Admiral Sir George Zambellas will be providing a key note presentation on day one of the conference on 'The importance of Unmanned Maritime Systems for Future Naval Operations'. Sir George will discuss: key trends in unmanned technology. the impact of UMS on naval tactics and how manned-unmanned teaming can enhance the navy's ability to complete missions effectively.